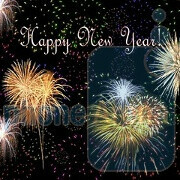 PhoneArena wishes you a Happy New Year! We'd like to say a BIG "THANKS!!!" to all of you, our dear readers, for being the awesome and enthusiastic people that you are! It's not a secret that we owe all of our success this year entirely to you. And we have even bigger plans for 2012! Of course, you can expect many new features that will make your PhoneArena experience even more engaging and informative. While on the topic of being informative, you shouldn't forget that it'll be CES 2012 time as soon as next week! So, once again we're in for an amazing start of the year. Now, allow us to leave you in the company of your friends and family, so that you can have an unforgettable New Year's Eve! Happy New Year !!! How do people thumbs down a comment like this ?? Happy New Years and hopefully this year we won't see anymore POS phones like the Nexus with its failed and aged hardware. To all the sheeps: hopefully you all will stop jumping on the the google D1ck. still have 12 minutes till new year here but happy new year to everyone! Right back at ya' buddy! You're a real class act, as always. Happy New Year to everyone! To all the Android, iOS, WebOS, Blackberry OS, Symbian, Bada (we miss you Pete) and WP7 fans ... The readers and writers, the ones who gave me thumbs up and even the ones who hit me with thumbs down... It's been fun! I look forward to what PA will bring us in 2012. See ya next year!!! Lol close enough happy new year everyone!!! I'd like to extend my gratitude and thanks to you, the readers. You make every moment very rewarding! Thanks a lot everyone and I wish you all a great new year. Happy New Year, PhoneArena! it's already 10:00 AM here in the island of Java (Indonesia). :) thanks for providing us news & articles. And most important Grand Theft Auto 5!! Happy new year to all and a safe one. Don't drink and drive and may android users have an Os that isn't complicated, ios may it get less communist and better hardware without slapping the letter S on it, BlackBerry actually care about staying alive, and windows phone 7 as incredible it is, may you finally get dual/quad core (lte,hspa+) variants. Guys I can't tell you how excited I am because you already know tech evoles fast. We will be presented with new consoles (Wii U) Os (windows 8) and Steve jobs resurfaces as Bruce Wayne.